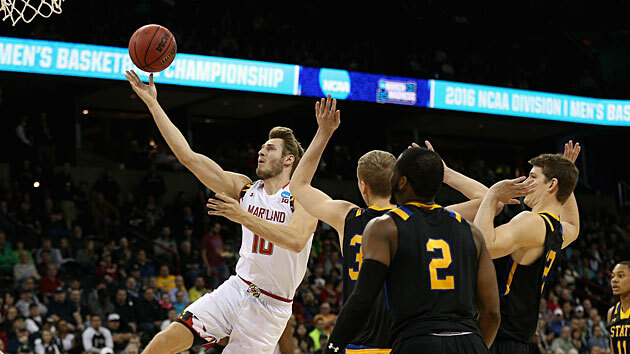 The Maryland Terrapins held off a late rally from the South Dakota State Jackrabbits on Friday for a first-round win in the NCAA tournament. South Dakota State cut an 18-point Maryland lead down to two in the final minute and had the ball in the final seconds down three with a chance to tie, but the Terrapins' Rasheed Sulaimon got a steal and game-sealing dunk with 0.2 seconds left to beat the Jackrabbits 79–74 in the South regional on Friday. Maryland, the No. 5 seed, never trailed in the game and led by 12 at halftime. The lead stretched to 18 on a Jared Nickens three-pointer with 13:58 remaining and was still 18 after a Robert Carter basket with just under nine minutes to go. But South Dakota State, bidding to become the third No. 12 seed to win a game in this tournament, made four three-pointers during a 24–8 run that to get within 72–70 with one minute left. The teams traded free throws, setting up the final play when Sulaimon took the ball away from Keaton Moffitt and went in uncontested for the dunk. Maryland shot poorly in its Big Ten semifinal loss to Michigan State last weekend but recovered to make 52.3% on Friday, including 40.9% from three-point range. Jake Layman scored a game-high 27 points and point guard Melo Trimble added 19 before fouling out in the final minutes. Though the Terps would be wise not to let teams with less talent continue to hang around, they should be heartened by the performance of Layman, the 6'9" senior forward who set a new season high for points for the second time in three games. Layman, who averaged 11.2 points per game coming in, had 26 in the Big Ten quarterfinals against Nebraska before going for 27 on Friday. The Terps will face No. 13 Hawaii on Saturday in Spokane. The Rainbow Warriors upset No. 4 Cal, 77–66, in the first round and will give Maryland a much harder matchup on the inside.